His previous films (Not a Love Story, Rakta Charitra, Phoonk) have been trashed by film critics and ignored at the ticket counters, but this has not harmed the brand value of Ram Gopal Verma, who continues to capitalise on it. He is back with yet another ambitious film, Department, with Amitabh Bachchan, Sanjay Dutt and Rana Daggubati (Dum Maro Dum) in the lead roles. 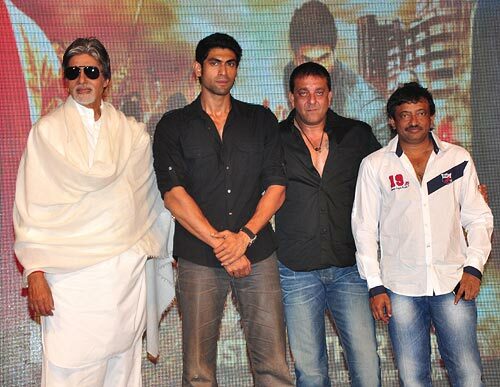 At a press conference at Mehboob Studios in suburban Mumbai, the cast made a dramatic entry as characters they play in the film. So Sanjay Dutt, who plays an encounter specialist, speeded up in a Qualis, the official vehicle of the Mumbai Police, while Rana arrived on a bike, which unfortunately broke down, forcing him to walk sedately towards the stage. 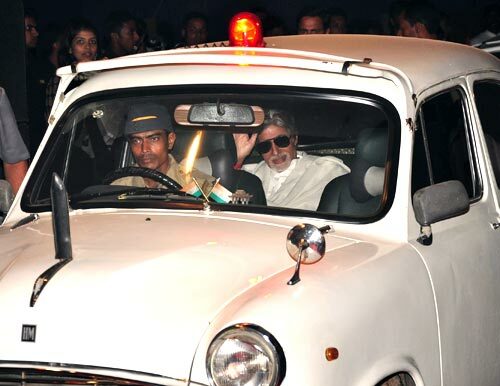 Amitabh Bachchan, who plays a hot-headed criminal with Machiavellian traits, chose to be deliberately ironical by driving up in a staid old-fashioned Ambassador. Verma's fascination with the underworld is well known courtesy the gangster films he's churned out in the past decade. Asked whether this time he deliberately chose to relegate crime bosses to the back seat and focus on the cops, he said, "My fixation is with power and larger-than-life characters. They've fascinated me ever since my growing-up years. "When you say I'm focusing on cops, moving away from the underworld, it isn't entirely true because both are heavily interrelated." Department, he said, is very commercial in nature. "The story is about the politics within, which a layman isn't exposed to. What is also different about Department is the fascinating format of narrative that I have chosen." The director dismissed any similarities with his previous film Sarkar , saying at best it is "a nasty version of Sarkar". The film, he said, will give a startling insight into "whatever goes around in the police department". Amitabh Bachchan was rather short and clipped in his replies. Did he agree with Ram Gopal Verma that Nishabd is his best performance to date? "Yes," replied the iconic actor, without further embellishment, much to the dismay of the media. However, when a reporter bluntly asked him whether he would consider doing a film with Rekha -- who he once allegedly had a much-publicised affair with, and did as many as nine memorable films with -- the megastar took some time to react. "If a great story comes along, why not?" he finally said. A special song from the film, Thodi Si Jo Pee Li Hai was screened and received with much enthusiasm. Department releases on May 18. Mika sings for Amitabh Bachchan! Readers' Pick: Shakti Kapoor is India's Gay Icon!